I love fudge. I don't make it too often, mind you, or I'd be terribly rotund, but every once in awhile it's a nice treat. I love this recipe in particular, because it's simple. No candy thermometer required, only five ingredients (with an optional sixth). Rather quick to pull together as well, if you don't count the cooling time, (you don't have to if you don't mind rather warm fudge, but it is a lot easier to eat when it's cool). What's more, you can change the flavor to suit your tastes. The original recipe calls for peanut butter rather than Nutella, and you can change the baking chips used to any flavor you like. 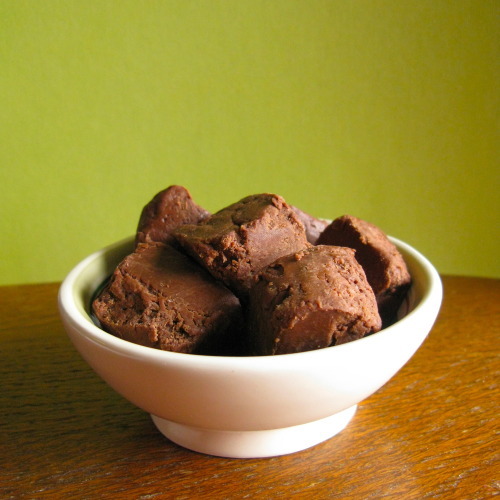 You could actually make chocolate-free fudge if you so desired. (Not that you should, as, well, chocolate is amazing.) Whatever your tastes, you'll find this fudge will suit them. Enjoy! Note: Please, PLEASE measure all your ingredients out before you begin. Everything moves very quickly at the end of the recipe and you need to be able to dump things into your pan quickly. Line an 8 in. square pan with foil, leaving the foil to extend over the pans edges. Butter the foil, and set the pan aside. In a 2-quart saucepan, combine sugar and evaporated milk. Cook and stir over medium-high heat until sugar mixture boils. Reduce heat to medium, continue cooking for 3 minutes, stirring occasionally. Remove from heat. Immediately stir in peanut butter or nutella, chocolate pieces, and marshmallow creme. Stir until the chocolate melts and ingredients are well combined. (Stirring will become difficult, hang in there!) Quickly spread fudge evenly into the prepared pan. Sprinkle with nuts, if desired. Cover and chill for 2 to 3 hours, or until firm. When firm, remove fudge from pan, using the overlapping foil to lift fudge. Place on a cutting board, cut fudge into squares. Store, covered, in an airtight container in the refrigerator for up to one week.